Now you can control power to your whole computer system with a single click. 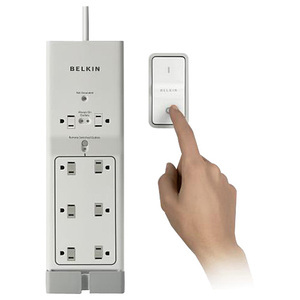 The Conserve Switch Surge Protector with Remote lets you shut off power, including standby power, to all of your components with one touch of the wireless remote switch. The wireless remote controls six remote-switched outlets for all your peripherals, your monitor, printer, external hard drives, speakers and more.